New Winter 2018: Let your diamond darling know that she’s awesome on and off the field with a personalized girls softball ornament that is one of a kind. 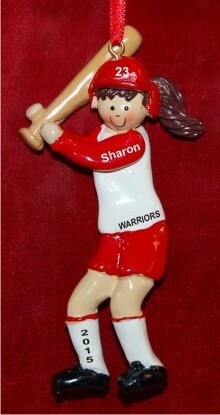 The girls softball red uniform brunette hair personalized ornament includes her name and more. The details you provide will be painted on by hand in a pretty font to create a personalized girls ornament just for her. Like most of our personalized sports ornaments for girls, this one arrives with a cord that makes it easy to display anywhere it makes her happy. The female softball red uniform personalized Christmas ornament includes our exclusive velvet gift pouch.